The phrase The Wild West describes a unique time and place in American history. There were many people who embodied the spirit of the Old West and one of those larger than life characters is Belle Starr. Known as The Bandit Queen, Belle Starr has taken her place in history among the outlaws and desperados of the Old West. Clearly, she did endorse a lawless way of life, best expressed in a comment by her to a Dallas newspaper reporter, "I am a friend to any brave and gallant outlaw." Her husbands and consorts were men notorious for their crimes. 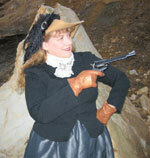 After marrying the outlaw Sam Starr, her home was refuge to outlaws and renegades. However, Belle Starr was only ever convicted once and that was for horse theft. For this, she served nine months of a one year jail sentence, ironically released early for good behavior. But perhaps what engages our curiosity most about this remarkable woman is the very fact that she was a woman who made a name for herself in a man's world. It was a rough and tumble time, but Belle Starr held her own. It was unusual for a woman to earn the respect of the men of her time. But, Belle Starr was a reckless and daring woman, living in a remarkable place and time. The life of Belle Starr gives us a glimpse of the rash and reckless spirit of the Wild West.